1. Preheat oven to 180°c/360°f. 2. In a bowl, mix the potatoes, onion, rosemary leaves, olive oil, some salt and pepper. 3. Arrange the sliced potato mixture in a baking dish to neatly cover the entire bottom. Push the 2 unpeeled garlic cloves into the potatoes one on each side of the pan. 4. Spread the chopped tomatoes over the potatoes. Add the warm water. 5. Nest the fish slices among the vegetables. 6. 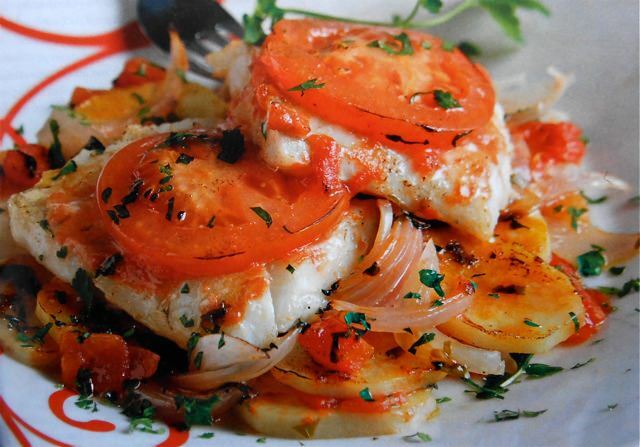 Place a tomato slice on top of each fish slice and sprinkle with oregano. 7. Bake in the preheated oven for about 1 hour, occasionally pouring some of the pan juices over the fish. 8. Add the olives and return to oven for another 15 minutes. Add some water if needed. 9. Remove from oven and sprinkle with chopped parsley and freshly ground black pepper as garnish. Serve with crusty bread and a large tomato salad.